Allen twice led Clemson in rushing, and the entire ACC once, but a knee injury hindered his performance as a junior. 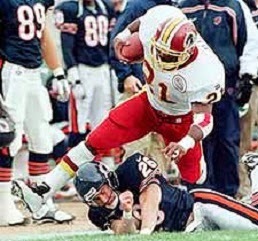 Despite the injury, he chose to enter the 1990 NFL draft and was picked by the Minnesota Vikings in the ninth round. Allen sat out his rookie year due to knee surgery but performed well in spot duty in 1991 as he rushed for 563 yards while averaging 4.7 yards-per-carry and providing outside speed. He broke out in ’92 with 1201 rushing yards and 13 TDs, plus another 478 yards and two touchdowns on 49 pass receptions, and impressed with his determination. However, Allen missed all of 1993 due to another knee injury that required surgery and, while he came back to rush for 1031 yards in ’94, the Vikings released him and he moved on to Washington. He performed well for his new team, gaining 1309 yards on the ground, catching 31 passes, and scoring 11 touchdowns. Redskins went 9-7 to finish third in the NFC East. Allen played two more seasons with the Redskins, missing significant time due to injury, and rushed for 724 and 700 yards, respectively. He saw his last major action with New England in 1999 and rushed for 896 yards and eight TDs, moving on to New Orleans and Baltimore in 2000 and ’01 for spot duty in his last two seasons. Overall, Allen rushed for 8614 yards on 2152 carries (4.0 avg.) and caught 204 passes for 1601 yards, scoring a total of 79 touchdowns. Of those totals, 4086 rushing and 726 receiving yards came with Washington, along with 39 TDs.